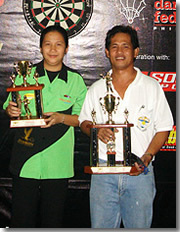 Jan-Jan Hinojales of Robson-Davao continued her dominance of the Ladies Singles winning her 8th Darterong Pinoy Ladies Singles. Upcoming player, Ging Martirez of Robson-Project 4 came in 2nd after disposing ranked players Rose Noble, Thelma Pineda and NDFP no.1 ranked Sheila Brana of Socodarts – South Cotabato. Joint 3rd were Edna Granada of Amber and Sheila Brana. Jemel Modesto of the Escopa Darts Club broke the dominance of the UDT and ACDC in the Youth Singles, beating Nico Argamaso of ACDC 4-1 in the finals. Ren-ren Santos of UDT and Michael Relucio of Navotas came in Joint 3rd in the biggest field of 50 youth singles players. The revived Seniors Singles of 45 years old and over saw 52 players vying for the championship. Al Sagario of Las Pinas beat Abat Logatiman of Marikina, another balikdarter with a score of 4-1. Edu Paginag NIA and Larry de la Cruz of Pasig were Joint 3rd. Pier 1 of Duds Cansana composed of Toto Andrade, Dhoe Macasaquit, Jessie Anion and Allen Macalino won the Fixed 4-Person Team Championship. Robson Tungsten of Jan-Jan Hinojales, Bert Lozano, Ricky Mijares and Noel Malicdem came in second while Joint 3rd were IDOL 1 of Joel Hizon, Mon Oliveros, Joseph Veridiano and Norman Espiritu / Team Sadati of Ritchie Ebol, Doods Tabo-oy, Ian Bolinget and Mike Velasquez. NDFP ranked 1 and 2, Jojo Barellano and Ian Perez came through as expected in the Fixed Doubles beating surprised finalist Jerry Salenga and Marlon Tapang of Makati City. Ricky Mijares and Noel Malicdem / Sonny Santos and Eric Alfuente of Kalookan settled for Joint 3rd. Abu Dhabi based Joel Hizon teamed up with Rose Noble to beat the tandem of Mon Oliveros and Edna Granada. Noel Malicdem and Ging Martirez / Gilbert Noble and Baby Villanueva were Joint 3rd. A record registration of three-hundred eighty six (386) players saw action in the Classified Draw Doubles dominated by non-ranked men’s players. Martin Pagulayan of Dartstorm-Proj 4 and Prussian dela Cruz of Tondo won over Rose Noble and Danilo Cardeno of NFA. Jan-Jan Hinojales and John Valdez of Cavite / Erwin Medina (UDT) and Joel Palalay of Cavite came in Joint 3rd.